The VPD’s Montague has stated that issuing this vague threat that PiDGiN picketers may be arrested is an “unusual step” for his department. In an interview with The Mainlander, Nicholas Perrin countered that the arrest of housing activists has also been a regular practice since 2008, noting that the Mayor — who chairs the police board — has approved the arrest of housing activists at the Olympic Village, the Fraser Street shelter, and the Granville shelter. Posted in City Hall, Gentrification, News, Police. Bookmark the permalink. Criminal Code of Canada: Know your Laws! I simply suggest the protesters continue to “communicate information,” as is also their well-known Charter right. So long as that is the chief activity, arrests would be unnecessary and illegitimate. As I walked down Seymour yesterday I noticed quite a few storefronts available to lease for restaurants or other businesses. It still needs to be explained clearly to me why restaurants such as Pidgin have to situate themselves in the centre of the DTES rather than in the neighbourhoods in which many residences have already been developed and sit 1/4 (at least) empty.. Oh, cheap rent? Well perhaps discussions should be had about restaurants that can’t make a go of things at regular market rents in the neighbourhoods of their clientele. Nice to see these people wasting everyone’s time and money and attempting to ruining a small business as opposed to literally doing anything else useful with their time. 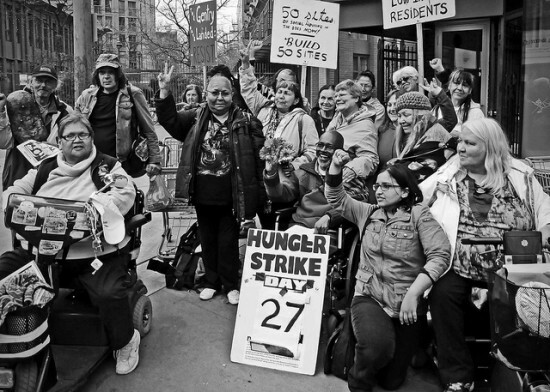 More information on the history of this specific site and its once significant contribution to housing in the area was provided on The Mainlander here: http://themainlander.com/2013/03/04/eat-the-rich-picketers-promise-to-shut-down-pidgin/ . To know your history is to respect your elders and your customs and culture; we have little else to guide us. The Mayor and the council are in the pockets of the gevelopers as has been shown by his actions against the homeless. I am, presently, going through the tapes of the Public Hearing concerning Rize. he Canadian Media, as is their wont, have neither investigated nor been in attendance at all the Hearing. By this derelictiion of their duty of journalism they have shown, once again, that taking their paycheques and playing the role of journalists is all they are good for. They are neither journalst or reporters. They are stooges of the developers. Anyone reviewing the tapes will see and understand how this egregious assault against ordinary citizens has come to pass. There is corruption in this council that includes, virtually, every member. In atttending a meeting of one of the people that review upcoming projects one of the members of this council selected professionals gave his acceptance of a project that wants to build at 7th and Main. What the man did not disclose was that he has a project that is coming for review that is situated at 2nd and Main. He neither disclosed his conflict of inerest nor recused himself from the decision. This is what Vancouver politics has gotten to. What are you going to do about it? Wendy’s definition of a “huge” turnout differs considerably from mine. Or were there hundreds of protesters not captured in the shot? There are thousands of residents living in the DTES ( including me), and it always seems to be the same small handful who do all the protesting. The “usual suspects” as I call them. It’s about time that the city stands behind PiDGin (a business that contributes to society) and stands up to the people who only want to take from society. I understand the frustration as to the housing situation in the DTES however I’m not sure how productive it is to aim this frustration at a small-time business owner who -if his business does fall – would potentially be financially crushed. This is a problem that is far more wide-reaching than one small business. Why not protest the persistent development of condo’s in Vancouver, particularly the new development in Chinatown rather than focus all these efforts on this. Perhaps there are details I’m missing, but it seems misguided in my opinion. Small business owner? That’s a little mealy mouthed for me. This is some hobbyhorse by some dude who made a lot of bank providing the IT infrastructure for high-frequency trading. This is not some guy trying to feed his kids. I understand the concern for the neighbourhood. But the personalized attacks against Brandon, his family, and the staff of this restaurant need to stop. Two years ago I suffered a near-life-ending brain injury. Two subdural hematomas. Brandon and his wife took me into their home, I recovered there for several weeks. Despite my insistence, they refused any gifts I tried to offer. They literally nursed me back to health while I learned to walk and talk again.That’s the side of Brandon these protesters don’t know – he is a loving, caring man who stepped up for me in my darkest hour. I support the call for more social housing, but this is not the way. And they are threatening people… why? I am sure that this is a story that is tres blase, however, it is par for the course in the neighbourhood. Live on the streets for more than a comfortable weekend.